00:39 Testman oldcoder how do i make a teleport potion on lot? 00:49 Testman est31 do u know how to make potions on the lordofthetest game? 00:50 Testman how do i get there? 00:52 Testman to the forbidden crafting guide? 02:44 jhcole when I override a default mod like bucket by placing my code in .minetest/mods/bucket the server issues a warning. Is there a way to override without producing the warning? Like maybe a way to tell the server don't worry I did that on purpose? 02:53 OldCoder Testman is gone? 05:42 cornernote Sokomine, got a link ? 05:42 cornernote i was thinking about doing that... if you already did it then that is awesome ! 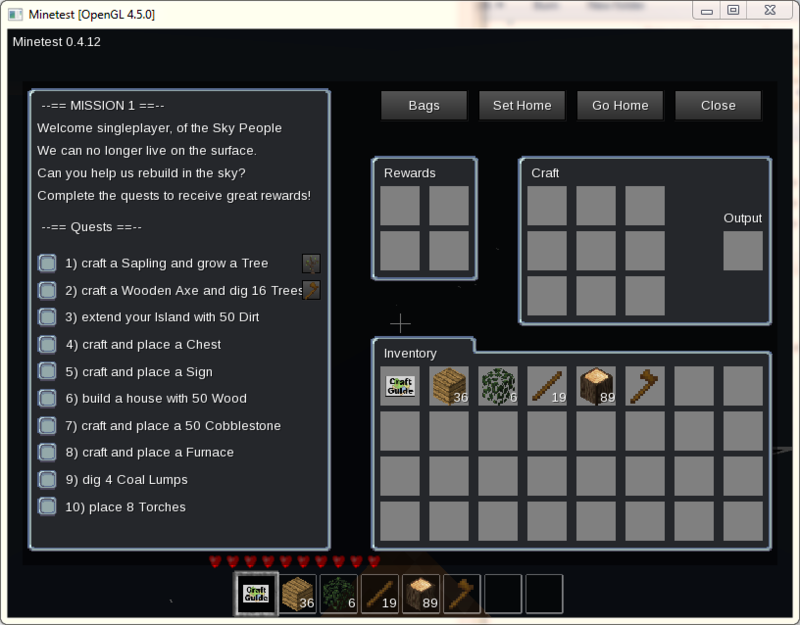 05:43 cornernote perhaps we can work together on skyblock ? 06:54 cornernote very cool ! 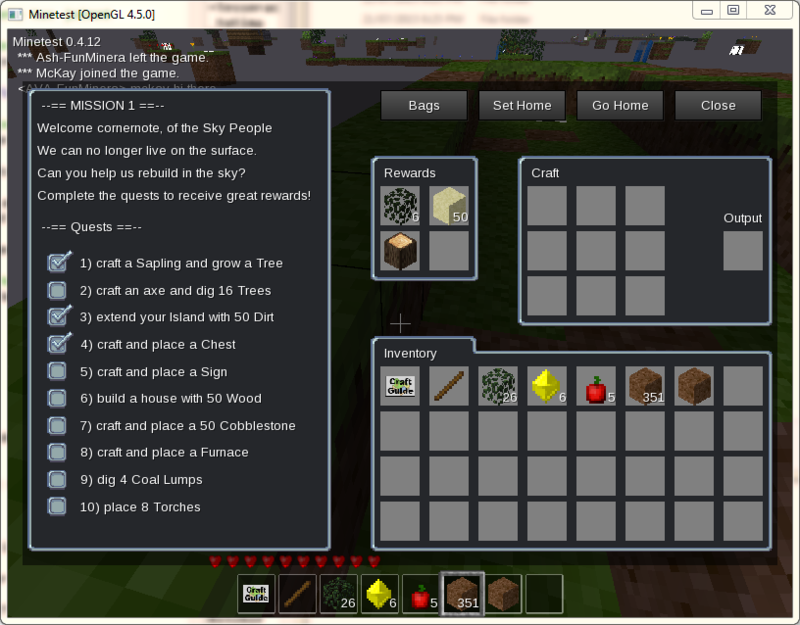 08:05 cornernote are you using the latest dev of skyblock ? 08:09 cornernote is this in the dev version of minetest? or in the release ? 08:27 cornernote can i use minetest.show_formspec to emulate opening the inventory ? 08:33 Krock what do you mean by "without re-drawing the formspec"? 08:33 cornernote i dont want to pass a formspec string in... i just want it to open as if the player pressed "I"
08:35 Krock is that what you're looking for? 11:45 Routh Anyone know a way to make a biome flat? 11:46 Calinou only a specific biome, or whole map? 11:46 Routh I have a ruined city biome I'm making, ideally it should be a flat or close to flat. 11:49 Routh Hmm, that could work. Is there a way to just shrink the y variance in the noise for that one biome? 11:50 Routh Thinking of it further I wouldn't necesarily want it completey flat, as cities aren't always flat, they are just much smoither. 13:50 Routh Sokomine: My plan is to do something like mg villages but the decorations for the biome will ba random skyscrapers, banks and fast food places etc that are all decayed and grown over. 13:55 Routh Glass and metal would last a while, drywall and polymer tiles not so much. Concrete would deteriorate depending on certain factors. 13:56 Routh Skyscrapers would fall over, but the first few floors might survive. 13:58 Routh I kind of picture the skyscrapers as a few floors with the top floor having metal mbeams and loose wires on top, and the rest of the building being a pile of rubble to one side that expands for 20 blocks or so. The glass in skyscrapers might not deteriorate so fast as many modern ones use high tempered glass. 13:59 Routh Yeah that would be a good one to review. 15:30 bobomb can i get edit access to the minetest dev wiki just long enough to make some notes in a few sections? 16:25 Krock rubenwardy, 30 mins.. how come? 16:27 Krock all minetest textures are files..
16:28 bobombolo but can they be generated on the fly and saved to file? 16:29 Krock bobombolo, I don't get what you're trying to do. 16:30 bobombolo not textures. basically a map. 16:30 Krock do you mean a minimap? 16:30 bobombolo sort of but not one that is visible in the corner all the time. 16:33 bobombolo i know about that lib, i don't want to use a lib. 16:34 bobombolo just looked. so that's no good. 17:16 Krock rubenwardy, typo in one of the issue labels "unco m firmed"
17:45 bobombolo how to get heightmap object after mapgen has run? 18:29 Routh Does technic mod not have a radiation or hazmat suit? 18:33 Calinou team talk should probably be like that: (TEAM) <rubenwardy> hello! 18:48 Krock bobombolo, just wonder: are you bob or a bomb? 19:32 est31 too many servers with too much noise? 19:36 CWz est31: to much screaming to much crying to much rage. 20:47 sofar and making me download a program how large? 20:49 Krock you're seriously raging just because you have a way better compression/decompressio tool installed now? 20:49 Testman hey do you know what the irc name is for lott in kiwii? 20:52 Krock btw, why do we all just have 5 characters in our nickname? 20:52 est31 Krock, its even better to have a team of trusted packagers package open source software for you. 20:58 Testman does anybody know the adress to lott irc connetion to the server? 20:59 est Testman, perhaps ask on the server itself? 22:22 Kpenguin Hey, did the server just go down? 22:28 Kpenguin Other than mine them? 23:19 Testman how do i get to the conecting channel again for lott? 23:53 xfceKris Anyone run the Dwarves game? 23:55 Testman does anyone have the irc channel name for the lott server conetion? 23:56 Testman should i not have asked that here? 23:56 est Testman, which lott server do you mean? 23:56 est is it on its forum page perhaps? 23:57 xfceKris I keep getting an error when trying to play it. keeps telling me to use the latest github..which I am already doing. 23:57 est so whats so hard about logging in, then asking others in the chat? 23:58 est join #freeminer and ask proller how to get it. 23:58 xfceKris What's freeminer? never heard of it. 23:59 xfceKris Ah, I'll check it out.